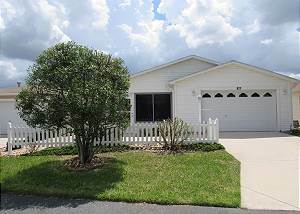 The Villages, Florida United States - Just listed for 2019 season with 4 seat golf cart!! | RE/MAX PREMIER REALTY Inc.
Just listed for 2019 season with 4 seat golf cart!! Great location in the Village of Ashland, 2/2 patio villa, enclosed lanai with table and chairs, patio on the side. Get to Sumter Square in 10 minutes. Close to shopping, dining, many golf courses. This is a very comfortable home with the kitchen overlooking the dining and living area. Dining table seats six. King in master bedroom, queen in guest. Nice walk in shower in the master. Large master closet. Linen closet in the hall. Washer and dryer is inside with a large pantry in the utility room.